On the cover of the January issue is our hands-on of Qualcomm's Snapdragon 8cx reference laptop, a fresh attempt to be faster. Our lab tests will tell you how Snapdragon stacks up against Intel. We also examine two of the top DNA testing services, explaining their differences and we help determine which one might be better for your situation. Plus, you'll find an exclusive first look at Creative Labs’ high-end SoundBlasterX AE-9; you have to hear it to believe it. Watch: The VortX by Whirlwind FX calls itself “the world’s first environmental simulator for PC gaming,” tackling that “immersion” problem all screen-bound games have by analyzing the action on-screen and blowing wind on your face to match. We had to try it. 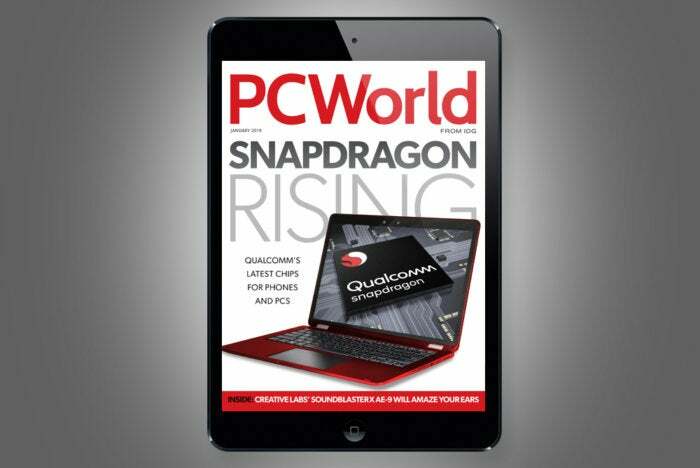 This story, "PCWorld's January Digital Magazine: Snapdragon rising" was originally published by PCWorld.